To reduce the charging time, the QC45BATT is able to deliver power up to 50 kW. However, the power required from the grid will not be higher than 20 kW, there by reducing costs to the charger’s owner and adverse side effects caused in the grid. The battery of the storage system has capacity to store enough energy for two or three consecutive charges, depending on the electric vehicle, and guarantee that the power supplied to the EV can achieve 50 kW. 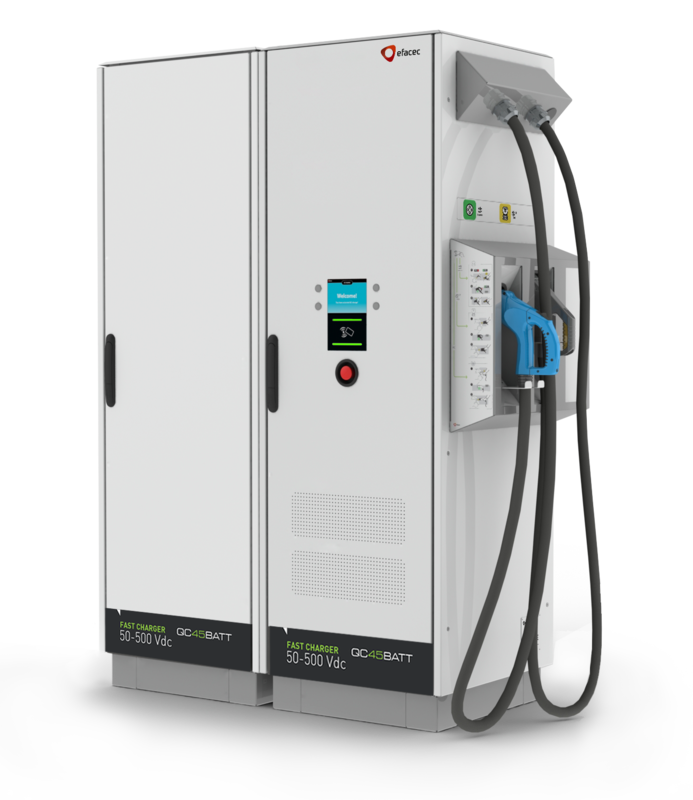 The QC45 has DC output with power up to 50 kW both for CCS or CHAdeMO protocols. The battery charging status is displayed in a TFT color screen. The QC45 has high quality and robust enclosure with corrosion protection, equivalent to stainless steel, to ensure extended equipment lifetime. It’s composed by to pieces: power cabinet and battery storage enclosure.